During the 1970s, hundreds of thousands of people across Western Europe protested against civil nuclear energy. Nowhere were they more visible than in France and Germany-two countries where environmentalism seems to have diverged greatly since. 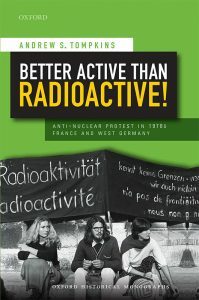 This volume recovers the shared, transnational history of the early anti-nuclear movement, showing how low-level interactions among diverse activists led to far-reaching changes in both countries. Because nuclear energy was such a multivalent symbol, protest against it was simultaneously broad-based and highly fragmented. ‘Concerned citizens’ in communities near planned facilities felt that nuclear technology represented an outside intervention that potentially threatened their health, material existence, and way of life. In the decade after 1968, their concerns coalesced with more overtly ‘political’ criticisms of consumer society, the state, and militarism. Farmers, housewives, hippies, anarchists, and many more who defied categorization joined forces to oppose nuclear power, but the movement remained internally contradictory and outwardly unpredictable-not least with regard to violence at demonstrations. By analyzing the transnational dimensions, diverse outcomes, and internal divisions of anti-nuclear protest, Better Active than Radioactive! provides an encompassing and nuanced understanding of one of the largest ‘New Social Movements’ in post-war Western Europe and situates it within a decade of upheaval and protest. Drawing extensively on oral history interviews as well as police, media, and activist sources, this volume tells the story of the people behind the protests, showing how individuals at the grassroots built up a movement that transcended national borders as well as political and social differences. For more information about this book, please see the New Books in German Studies interview with Andrew Tompkins.